← How to publish flip books online? You are allowed to save the document of PDF to DXF file of AutoCAD in different kinds of version, including DXF R9/10/12/13/14/15/18/21, etc. 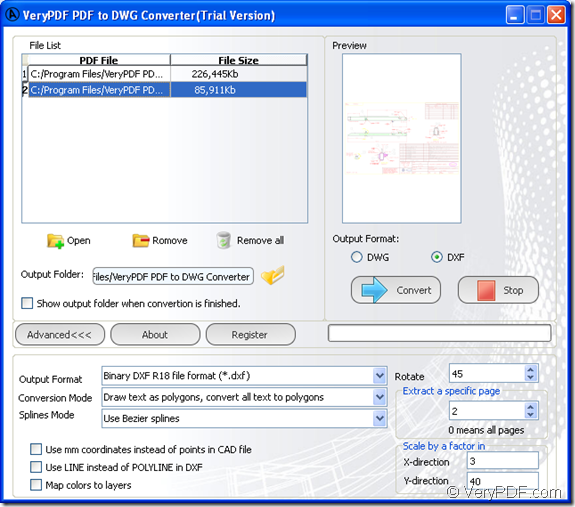 with help of VeryPDF PDF to DWG Converter You can also use this application to rotate the created DXF file by any degree or extract a specified page PDF document to DXF file. This article aims at showing you how to convert PDF document to DXF file with the application and you just need to download a free trial version of VeryPDF PDF to DWG Converter to your computer by clicking the following button. Then you will be able to use the application after installing it on your computer. Just double click the application icon or open it through Start menu. When you can see its interface, please add PDF document. You just need to click Open button below the file list and then choose the document from the popup file picker window. For example, if you want to convert PDF document to Binary DXF R18, this application is able to accomplish it perfectly. Please click Advance button and then please choose the option Binary DXF R18 file format (*.dxf). In addition, you can choose to convert text in PDF document to polygons, etc. in Conversion Mode dropdown list. In Rotate spin box, you can input any rotation degree to rotate the created DXF document or you can click two spins in the box to set rotation degree. If you need to convert specified page PDF document to DXF file, just input the page number in Extract a specific page spin box. The application also supports to scale created DXF file in X and Y direction. Please input the value from 1 to 100 in X-direction or Y-direction edit box. Please see the conversion step in next snapshot. In Output Folder edit box, please input the file path for target file. Or you can click the file folder button beside the edit box to choose one existed path. Select the output format as DXF and then click Convert button. Several seconds later, you will be able to check the created DXF document in specified output directory. If you still have any other questions about this application or the conversion from PDF file to DXF document, please leave your problems here. Via clicking the following two links, you will be able to visit the application homepage or download the free trial version. This entry was posted in PDF to DWG Converter and tagged PDF to DXF. Bookmark the permalink.